INSTANT DOWNLOAD THIS TUTORIAL NOW!!! 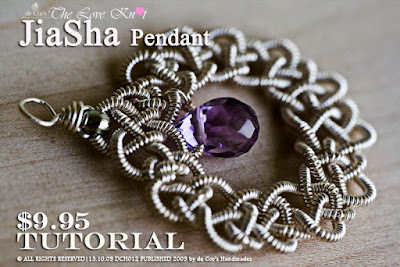 Note: Jia-Sha Tutorial's price is currently being marked down for de Cor's official Site Grand Opening. We reserve the right to revise the price without prior notice - SO GRAB IT NOW! This tutorial includes a very basic information about coiling wires with a drill, I strongly urge you to visit Ms. Perri's site to obtain a FREE and super detailed tutorial about Coiling with a drill. THANKS PERRI!!!. This tutorial is composed using 138(including coverpage) high-resolution pictures, all steps and procedures are zoomed and focus to deliver the precise instruction via a set of terrifically clear pictures. - Thanks to Ms. Perri Jackson for sharing the knowledge on coiling the wires with the right tool, I have been benefited from the knowledge shared. - Thanks to folks over the internet in sharing Chinese Knot knowledge that makes everything I do today possible.